Image galleries are everywhere on the web. In fact, most of the sites you frequent probably feature at least one gallery somewhere, and for good reason. Fortunately, creating your own WordPress gallery is simpler than you might imagine. In fact, you’ll probably spend more time choosing which images to use than you will putting them all together. Upload the images you want to include in your WordPress gallery. Add the images to your gallery. 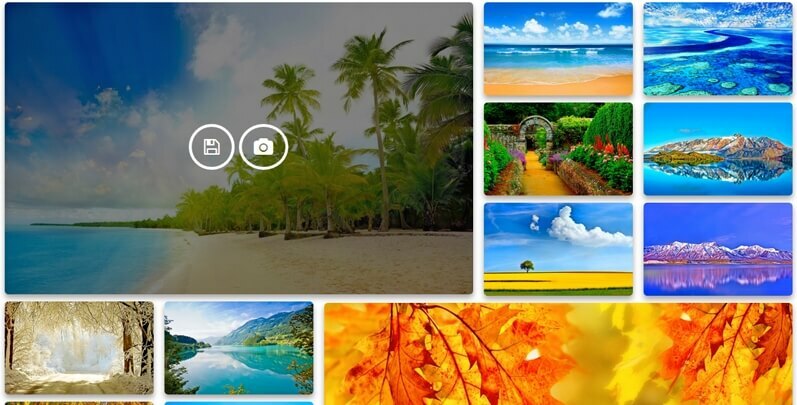 Place your gallery anywhere you want on your website. On top of that, we’ll also introduce you to seven of our favorite WordPress gallery plugins, so you can take advantage of features the platform doesn’t offer out of the box. Let’s get to work! 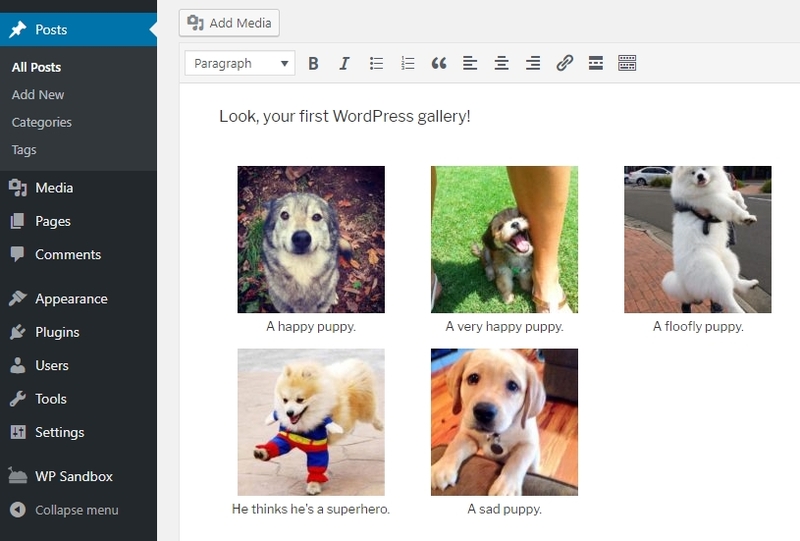 The first thing you’ll need to set up a WordPress gallery are some images. 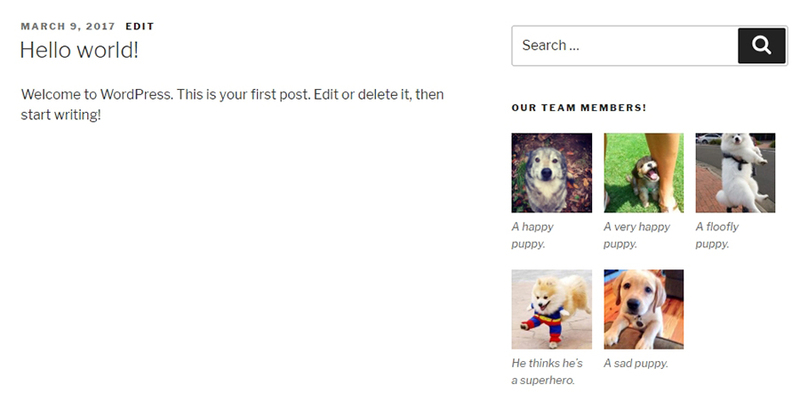 For this tutorial, we’re going to use stock pictures of puppies, to liven up the proceedings. Give the platform a few moments to work, until all your uploads are done. The time this takes will depend on your internet speed and the size (and number) of the images you’re uploading. If you find that the upload process is taking too long, you might want to cancel it and optimize your gallery images before putting them up on your website. Keep in mind that high-resolution graphics tend to look better, but they’re often far too ‘heavy’. In most cases, you should be able to compress them a bit without affecting their quality – a process called ‘image optimization’. Either way, you’ll be ready to move on to the next step once all your images are up and ready. Now that all your images are ready, find the page where you want to place the gallery and open it using the WordPress editor (or simply create a new page). Next, click on all the images you want your gallery to include. When you’ve selected them all, choose the Create a new gallery button at the bottom right of the screen, and you’re good to go! 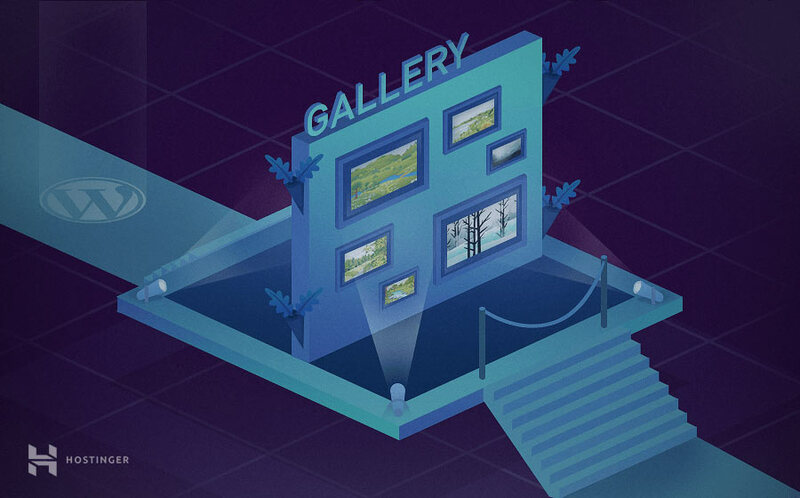 Let’s move on to the last step, where we’ll show you how to place your gallery. The bad news is that WordPress doesn’t enable you to re-use the same galleries you set up on other pages. If you want to copy a gallery, you’ll have to repeat the process, choosing the same images and settings. However, that shouldn’t take you long, since the images are already up on your website. As you can see, creating a WordPress gallery couldn’t be simpler! However, the types of galleries you can set up out of the box aren’t exactly rich in features. If you want to level up your WordPress galleries, you’ll need to turn to plugins, which is what we’ll talk about next. There’s nothing wrong with WordPress’ gallery functionality. However, with the right plugins, you can gain access to a lot of cool new features. Let’s introduce you to some of our top picks! Photo Gallery by 10web completely overhauls the WordPress gallery system. It provides you with several gallery layouts you can use, including slideshows, compact albums, and more. You can also use this plugin to implement lightbox effects, which opens the full-size image when someone clicks on it. Moreover, this WordPress gallery plugin enables you to include both images and video within the same gallery. You also get access to multiple widget options, instead of the single one WordPress offers out of the box. Overall, this plugin is the way to go if you want access to as much gallery-related functionality as possible. Pricing: The base plugin is free, while there are several premium tiers offering more effects, themes, widgets, and other features. Gallery by Robo is a fantastic plugin if you want a high degree of control over your galleries’ style and behavior. 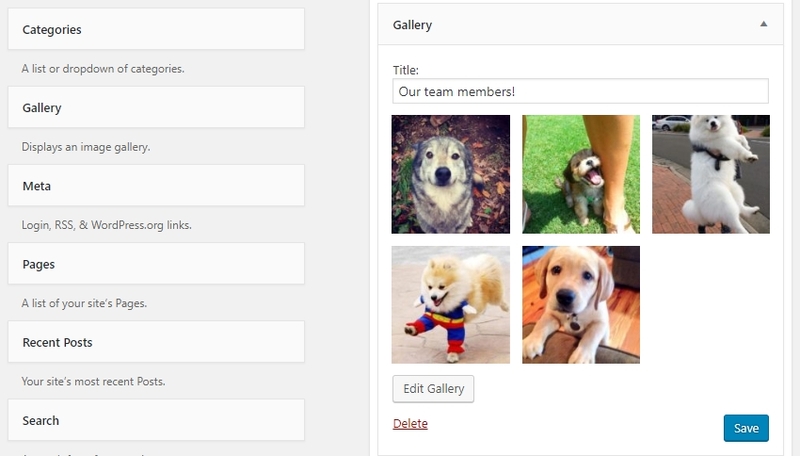 As with the previous plugin, this one enables you to choose from multiple gallery layouts for your site. However, it also enables you to add slideshow and hover effects, customize your font settings, and even include borders around your images. Along with these style options, Gallery by Robo also resizes your images automatically upon upload. This setting enables you to save space, since most sites don’t need gigantic images. Finally, this plugin ensures that all of your galleries are mobile-friendly. All in all, the high degree of customization makes Gallery by Robo a top option if you want to tweak every aspect of your site’s galleries. Pricing: You can create up to three galleries with the free version, or pay $30 for a premium, unlimited license. Although this plugin includes the word ‘portfolio’ in its name, you can use it to create any type of WordPress gallery you want. Along with images, GridKit Portfolio Gallery also supports videos from multiple sources, and WooCommerce products. Plus, it includes social sharing options so visitors can show your work to their friends and connections. Just like the other plugins we’ve seen so far, this one enables you to create mobile-friendly galleries. It’s also a fantastic option if you want to showcase client logos, create team member sections, and more. Overall, if you’re looking for a plugin that’s very flexible about the type of galleries it can help you set up, this one is a smart pick. Pricing: GridKit is a free plugin, although you can get a lot of additional features with one of its pro licenses. So far, all the plugins we’ve checked out make large changes to the WordPress gallery system. Responsive Lightbox & Gallery, on the other hand, is pretty straightforward. What it does is enable you to create responsive galleries out of the box, and it also includes lightbox functionality. You can configure your lightboxes’ behavior, choose from among three basic gallery layouts, and even use widgets to place your images where you want. This is one of the most intuitive WordPress gallery plugins we’ve tested, and it’s a useful tool if you’re looking for something straightforward. Pricing: This plugin is free from the WordPress Plugin Directory. You can also purchase extensions for it on the developer’s website. There are a lot of plugins that enable you to add videos to your WordPress galleries. However, few of them focus mainly on video galleries, which is why we like this one so much. With Video Gallery – YouTube Gallery, you can set up responsive collections of videos. You can link out to several video platforms, including YouTube and Vimeo, add effects to your thumbnails, include lightboxes, and more. Plus, you can place your video galleries anywhere you want on your site, using a simple shortcode system. Pricing: This plugin is a completely free option. Although it doesn’t have the most original name, Photo Gallery is still one of our top picks. It features a very all-in-one approach to WordPress galleries, and it includes almost every feature we’ve seen so far in other plugins. For example, this tool enables you to add hover and transition effects to your gallery images. It also supports image categorization and gallery navigation, which makes looking through massive libraries simpler. On top of that, Photo Gallery includes the option to add videos to your galleries, can lazy load your images, and even comes with social sharing features. Overall, if you’re all about micromanaging your site’s appearance and behavior, this plugin should be right up your alley. With it, you’ll be able to tweak every aspect of your galleries. Pricing: With the free version of this plugin, you can create up to two galleries and place them on posts or pages. The premium tiers enable you to create unlimited galleries and place them in more locations, along with offering some handy extras. Finally, the Envira Gallery plugin features one of the most user-friendly experiences we’ve found so far. For example, it includes a gallery-building wizard, which makes creating galleries a pleasure. Envira Gallery’s goal is to enable you to create multiple galleries and configure them easily. To that end, it includes multiple WordPress gallery templates, slideshow functionality, and social media sharing features. If you’re looking for a sleek WordPress gallery plugin that’s also easy to use, Envira Gallery should be one of your first picks. Pricing: You can opt for the free base version of the plugin, or purchase a pro version for additional features, support, and even the option to include custom CSS. WordPress galleries are simple yet useful elements. The process of setting up a WordPress photo gallery is easy, although you may want to spend a little while handpicking which images to include. Once your gallery is ready, it’s just a matter of placing it wherever you want on your site. Of course, you can also use dedicated a WordPress gallery plugin to get more customization options. Do you have any questions about how to create a WordPress image gallery? Ask away in the comments section below!